We take pride in bringing you the very highest quality. 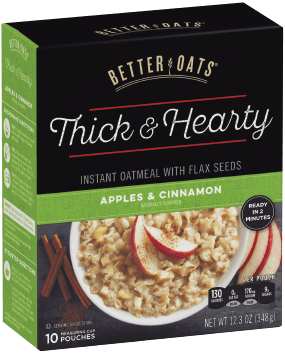 It starts with our premium oats, which are cut thick to preserve their natural texture. Then we add flax seed to deliver an oatmeal that is both nutritious and delightfully tasty. And, of course, we only use genuine pieces of fruit-never artificially dyed or reconstituted versions of other fruits. We think you will be able to taste the Better Oats® difference. 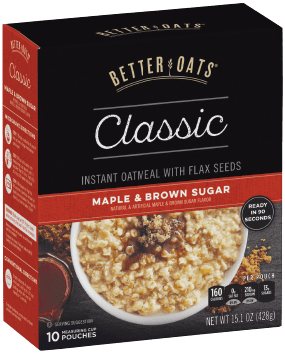 WHOLE GRAIN ROLLED OATS, FLAXSEED, SALT, SUGAR, ACESULFAME POTASSIUM, SUCRALOSE, NATURAL AND ARTIFICIAL FLAVOR, MOLASSES, MAPLE SYRUP. 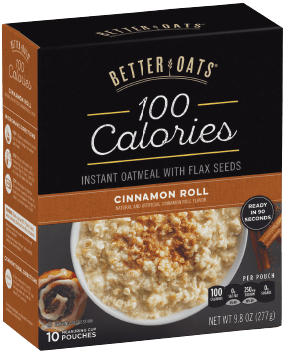 WHOLE GRAIN ROLLED OATS, FLAXSEED, SALT, DRIED APPLE PIECES, NATURAL FLAVOR, ACESULFAME POTASSIUM, SUCRALOSE, ASCORBIC ACID AND CITRIC ACID (TO MAINTAIN APPLE COLOR). CALCIUM CARBONATE, FERRIC ORTHOPHOSPHATE (SOURCE OF IRON), ALPHA TOCOPHEROL ACETATE (VITAMIN E), NIACINAMIDE*, VITAMIN A PALMITATE, PYRIDOXINE HYDROCHLORIDE*, RIBOFLAVIN*, THIAMIN MONONITRATE*, FOLIC ACID*. *ONE OF THE B VITAMINS. 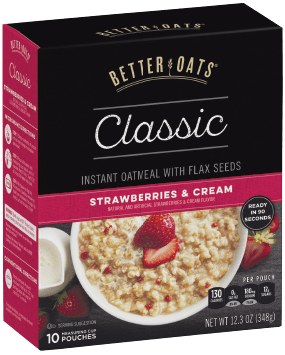 WHOLE GRAIN ROLLED OATS, FLAXSEED, SALT, SUGAR, NATURAL AND ARTIFICIAL FLAVOR, ACESULFAME POTASSIUM, CORN SYRUP, SUCRALOSE, CARAMEL COLOR. CALCIUM CARBONATE, FERRIC ORTHOPHOSPHATE (SOURCE OF IRON), ALPHA TOCOPHERYL ACETATE (VITAMIN E), NIACINAMIDE (VITAMIN 83), VITAMIN A PALMITATE, PYRIDOXINE HYDROCHLORIDE (VITAMIN 86), RIBOFLAVIN (VITAMIN 82), THIAMIN MONONITRATE (VITAMIN 81), FOLIC ACID. ORGANIC WHOLE GRAIN ROLLED OATS, ORGANIC BROWN SUGAR, ORGANIC CANE SUGAR, ORGANIC FLAXSEED, ORGANIC QUINOA, ORGANIC WHOLE GRAIN BARLEY FLAKES, ORGANIC WHOLE GRAIN RYE FLAKES, ORGANIC WHOLE GRAIN WHEAT FLAKES, SEA SALT, ORGANIC MAPLE SUGAR, NATURAL FLAVOR, ORGANIC INVERT CANE SUGAR SYRUP, ORGANIC BARLEY MALT EXTRACT, SALT. 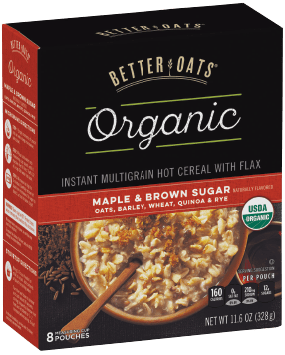 ORGANIC WHOLE GRAIN STEEL CUT OATS. 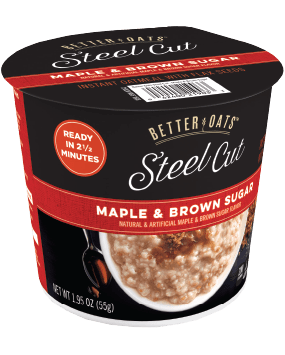 WHOLE GRAIN STEEL CUT OATS, ISOLATED SOY PROTEIN, BROWN SUGAR, SUGAR, FLAXSEED, SALT, STEARIC ACID, NATURAL AND ARTIFICIAL FLAVOR, MOLASSES, MAPLE SYRUP, WHEAT STARCH. WHOLE GRAIN STEEL CUT OATS, FLAXSEED, STEARIC ACID, SALT. 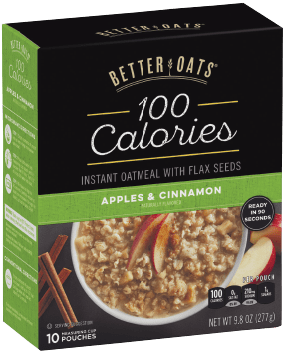 WHOLE GRAIN ROLLED OATS, SUGAR, DRIED APPLE PIECES, FLAXSEED, SALT, NATURAL FLAVOR, ASCORBIC ACID AND CITRIC ACID (TO MAINTAIN APPLE COLOR). 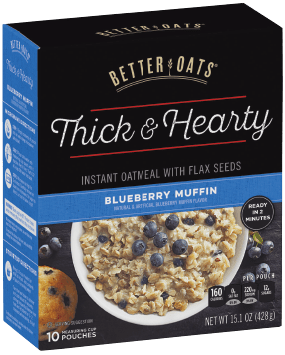 WHOLE GRAIN ROLLED OATS, SUGAR, FLAXSEED, DEHYDRATED BLUEBERRIES, SALT, NATURAL AND ARTIFICIAL FLAVOR, CITRIC ACID, CARAMEL COLOR. CALCIUM CARBONATE, FERRIC ORTHOPHOSPHATE (SOURCE OF IRON), ALPHA TOCOPHEROL ACETATE (VITAMIN E), NIACINAMIDE (VITAMIN B3), VITAMIN A PALMITATE, PYRIDOXINE HYDROCHLORIDE(VITAMIN B6), RIBOFLAVIN (VITAMIN B2), THIAMIN MONONITRATE (VITAMIN B1), FOLIC ACID. ONE OF THE B VITAMINS.